The Wilson Art Gallery will host "Side by Side: An exhibit of paintings by Claire Stankus" from Friday, February 27 to March 27, 2015. Side by Side features paintings created in pairs. Spanning the last two years, these portraits, still life, and landscapes showcase the interaction between similar and repeated imagery. 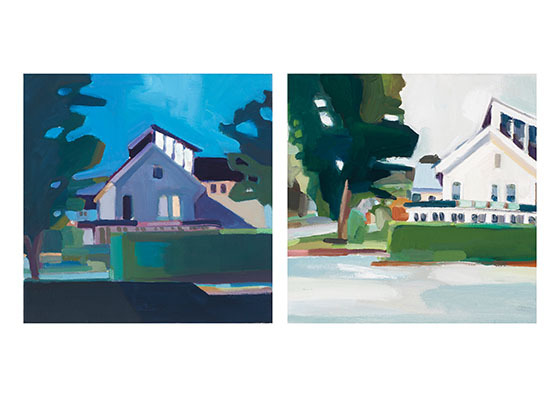 These paintings work together to identify relationships, and document subtle changes in time and mood. The figurative works explore parallel mannerisms in posed and candid portraits, while the landscapes and still life result from repeated observations of everyday perspectives. Routinely observing the same scenes everyday can illuminate how constant, mundane habits or surroundings develop new significance over time. Noticing these patterns in our lives reminds us how small and daily occurrences can become more memorable than a singular event, and encourages us to examine our environment a bit more closely. Claire Stankus studied painting and ceramics at Syracuse University. In her junior year she traveled to Florence, Italy for a semester abroad to study painting and art history. She graduated with a BFA in Painting in 2012. She was awarded a scholarship to attend the School of Art at the Chautauqua Institution in 2012, and in 2013 spent a month painting at the Vermont Studio Center in Johnson, Vermont. She plans to enter an MFA program in the fall. On Friday, February 27, from 4 to 6 p.m., there will be an opening reception for the exhibit. Side by Side will be on display at the Wilson Art Gallery from February 27 - March 27, during regular library hours. The reception and exhibit are free and open to the public.